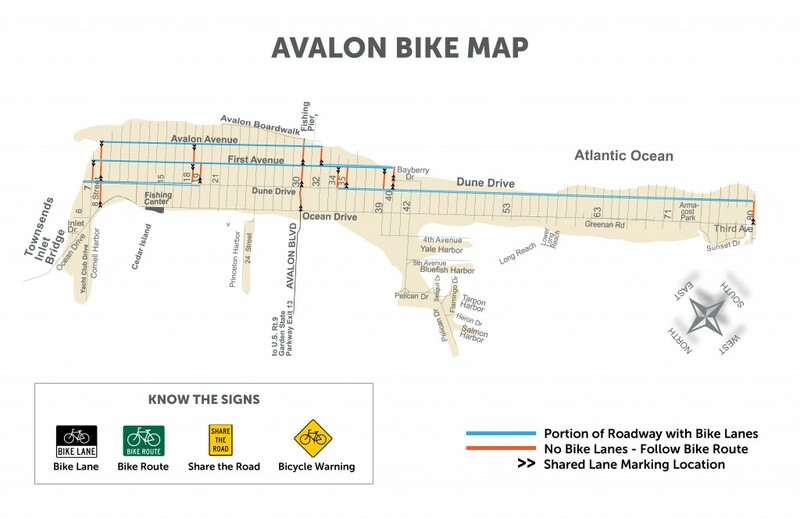 Avalon is a Safe Biking Community! The bicycle path is expected to be constructed during the second and third weeks of April; please note any temporary no parking restrictions, thank you! When in use at nighttime every bicycle shall be equipped with: 1) A front headlamp emitting a white light visible from a distance of at least 500 feet to the front; 2) A rear lamp emitting a red light visible from a distance of at least 500 feet to the rear; 3) In addition to the red lamp a red reflector may be mounted on the rear. This is a court-mandatory appearance. A bicycle must be equipped with a bell or other audible device that can be heard at least 100 feet away, but not a siren or whistle. This is a $54 ticket. A bicycle must be equipped with a brake that can make wheels skid while stopping on dry, level, clean pavement. This is a $54 ticket. Bicyclists should not drive the bicycle with feet removed from the pedals, or with both hands removed from the handlebars, nor practice any trick or fancy driving in a street. Limit passengers to only the number the bicycle is designed and equipped to carry (the number of seats it has). This is a $54 ticket. No person riding a bicycle shall attach themselves to any streetcar or vehicle. This is a $54 ticket. Every person riding a bicycle on a roadway is granted all the rights and subject to all of the duties of the motor vehicle driver. This is a $51 ticket. Every person riding a bicycle on a roadway shall ride as near to the right roadside as practicable exercising due care when passing a standing vehicle or one proceeding in the same direction. A bicyclist may move left under any of the following conditions: 1) To make a left turn from a left turn lane or pocket; 2) To avoid debris, drains, or other hazardous conditions on the right; 3) To pass a slower moving vehicle; 4) To occupy any available lane when traveling at the same speed as other traffic; 5) To travel no more than two abreast when traffic is not impeded, but otherwise ride in single file. Every person riding a bicycle shall ride in the same direction as vehicular traffic. This is a $54 ticket. In New Jersey, anyone under 17 years of age that rides a bicycle or is a passenger on a bicycle, or is towed as a passenger by a bicycle must wear a safety helmet. This is a court-mandatory appearance. An unlocked bicycle presents a crime of opportunity and provides an easy way for a theft to occur. The Avalon Police Department has a free bicycle registration program that enables you to register your bicycle with the police in the event it would be stolen. Call the Avalon Police Department at (609) 967-3411 for additional information.